You can read the article …. Posted: Monday, June 9, 2014 4:15 am | Updated: 9:33 am, Mon Jun 9, 2014. 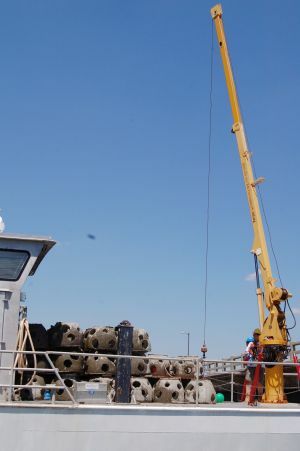 CAMBRIDGE — An ongoing effort to create an artificial oyster reef habitat sank into the Talbot County side of the Bill Burton Fishing Pier on Friday, June 6. Last fall, work was done on the Dorchester County side of the fishing pier. It was and still is a combined effort between the Chesapeake Bay Foundation, the Department of Natural Resources, the Maryland Saltwater Sportfishermen’s Association and Horn Point Laboratory in Cambridge. The work involves planting concrete reef balls designed to provide a hard substrate for oyster development and growth. Oyster spat are attached to the reef balls through Horn Point Laboratory. The reef balls were taken out Monday with the CBF’sPatricia Campbell — a specially designed boat with a crane built on it that has a GPS so workers can know exactly where they should drop the reef balls. Clint Waters, president of the Dorchester County MSSA, said only hard bottom is chosen to drop the reef balls on so that they’re not covered over with sand over time. Overall, more than 120 reef balls are going on the Talbot County side of the Choptank River this June, while 300 were planted on the Dorchester County side last fall. Aside from the oysters providing their well-known benefit of filtering high volumes of harmful nutrients from the water column they’re planted in, the reef balls provide other benefits. Erik Zlokovitz, coordinator of reef projects for the Maryland Artificial Reef Initiative (MARI) through the Department of Natural Resources, said his primary mission objective in this project is to benefit recreational fishermen. On Friday, Zlikovitz and a crew from CBF put about 60 reef balls overboard in between the Bill Burton Fishing Pier and the Sen. Frederick C. Malkus Jr. Memorial Bridge. Work is planned to continue on Monday, with a little more than 60 reef balls set for drop. And the program’s efforts are paying off, too, according to Waters. Waters said the project was initially started at Cook’s Point, where there are more than 1,500 reef balls planted to date. Waters said the reef balls only enhance the fishing wherever they’re dropped, and evidence of that can be found at Cook’s Point. The past couple of years after the reef balls were planted, Waters said, fishermen have caught large black sea bass. While fishermen were used to catching small black sea bass, the large ones were something not seen much, he said. “It has made a big difference. Like the old cliché with that ball field — build it and they will come,” he said. Follow me on Twitter @jboll_stardem.